Sauce buns and red hots were a summertime tradition back home and seem to be regional specialties not know to those outside of the small town I grew up in. Sauce buns are just like the name implies, sauce on a bun, but if you added a hot dog it became a red hot. These cannot be described as chili dogs or Coney dogs because they are sweeter than that. If you bite into one of these expecting a chili dog you will be disappointed. However, if you know going in that this is something totally different than that, you just might love them. These are much sweeter than a chili dog. It’s like a sweet sloppy joe filling flavored with some extra chili seasoning. This recipe is inspired by Jaenicke’s in Kankakee, the local hot dog stand where we used to eat these. I might be dating myself, but I remember getting a baby beer with my hot dog. These sauce buns have a sweet red meat sauce that is flavored with chili powdered, resembles chili, but doesn’t actually taste like chili. They are very hard to explain to anyone who has never had one or has never been to an old-fashioned root beer stand in the Midwest prior to big franchises. It’s kind of like sloppy joe and chili dog sauce rolled into one. I have never eaten at an A & W, but I have heard these might be similar. I have had Coney dogs, not the same. This is also not Cincinnati chili or Skyline Chili. This takes a while to simmer down, so give yourself about 4 hours of cooking time the day you make these. Since they do take so long to make, I suggest making a larger batch and freezing the leftovers. This sauce will also hold well on a stovetop over low heat or in a slow cooker making it a great choice for game day food. I serve these buffet style with sauce in one slow cooker and hot dogs in another. Cheese sauce and onions are the only toppings we have ever used on sauce buns and red hots, but since some people may be averse to a sweet sauce on their hot dogs, I include normal hot dog condiments too. Hot dog buns with sweet red beef sauce are sauce buns, add a hot dog and you've got a red hot. Mix everything, except hot dog buns, cheese sauce and extra onions for topping, together in a large sauce pot. Do not brown the ground beef first. Bring to a slow simmer, stirring frequently. Leave uncovered and simmer for 4 hours. Stirring often to prevent scorching and sticking. Sauce Bun: Serve on hot dog buns with cheese sauce and onions. Red Hot: Spoon over a hot dog in a hot dog bun. For a more authentic sandwich, heat the filled hot dog buns in a microwave for 20 to 30 seconds, just long enough to soften the buns. Nutritional data is for the sauce only. Hot dogs and bun data varies too much for calculations. I hope you like it! Some folks in Oklahoma find it too sweet and they either love it or hate it, the sauce is really nothing like a coney dog or chili dog. I so miss Sammy’s pizza! Our thin crust pizza recipe came from the need to recreate that too. It’s close but will never be as good as Sammy’s! Stop back by and let me know your thoughts. I am So Excited to try this recipe! I grew up in K3 and lived in Riverview, so Jaenickie’s was my go-to! We recently moved out of state and this is the one thing (besides Sammy’s pizza) that i am missing. Thanks for sharing! It’s not an exact match, but it’s close. We don’t go “home” anymore but when we did we would make at least 2 stops at Jaenicke’s! I cannot wait to try this I also grew up in Kankakee and love Jeanickies I love going home to visit and always have to stop for a sauce bun! I am so excited to have this recipe I hope it’s the same!!! As a fan of “all things hot-dog related” I stumbled across this recipe and gave it a shot. Oh, my lord – I wish I’d had the drive-in experience you talked. Funny how food can flood back memories – for me, it was sloppy joe’s that my Mom made from scratch when I was a grade-schooler. Really similar taste. I made it up, and also made up a batch of beef franks to make some of them “red hots”. 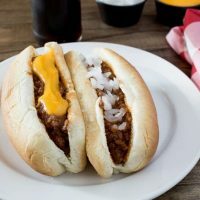 For the folks that didn’t care for chili on their hot dogs, and weren’t ready for the sauce buns – I had a selection of other hot dog condiments…pickle relish, mustard, diced onion, finely-grated cheese, and my secret ingredient – Celery Seed. All in all, it was a hit – will definitely be doing it again!